Molly, our car with which we have a love-hate relationship, wouldn’t start before breakfast, a las ocho (at 8 o’clock). Molly wouldn’t start after breakfast, a las nueve (at 9 o'clock). Would Molly start at medio día (noon), when Marilyn had her luncheon date? Since the car wouldn't start, Marilyn had to take the bus to her pre-school English class in Caluquí. The bright side of this was that she found a shorter path that only took 20 minutes to walk up the mountain from the Pan American Highway. When the chips were down, Molly was finally awake and rarin’ to go. Marilyn had arranged to take Maria, Don Segundo’s wife, to Victoria’s casa for lunch. The day before, Marilyn had asked Carmela, an elderly woman living here at the hotel temporarily, if she’d like to join the luncheon. After some convincing by her daughter as well as Isabel, Carmela agreed to go. So off Marilyn and Carmela went to pick up Maria. When they got to Maria’s, she was nowhere to be found. Finally, after a couple of neighbors had joined the search, Maria showed up carrying a load of grasses and herbs on her back that she had gathered for her cuyes (guinea pigs). Either Don Segundo had forgotten to remind her about the luncheon, or she had forgotten. 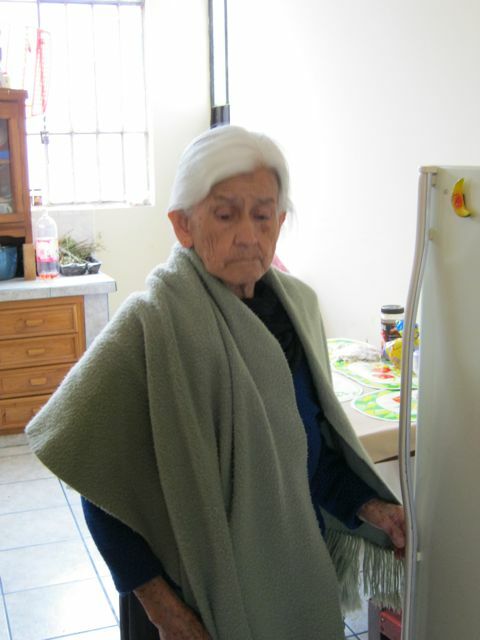 After quickly changing her clothes, she asked if Miriam, her niece and one of the searchers, could come with them. Maybe she wanted Miriam along for kidnap protection. 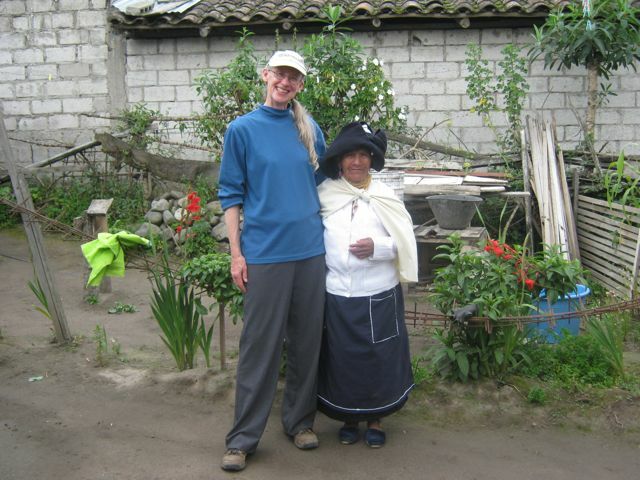 More likely, Maria wanted a good translator since her primary language is Quichua instead of Spanish. Lunch was interesting. Victoria had lunch all ready, but didn't seem to realize that Marilyn needed to prepare the dessert of apple crisp beforehand so it could cook while they ate. With Marilyn’s limited Spanish, she had a hard time getting Victoria to go visit her guests and leave her and the niece in la cocina to prepare the apple crisp. Anyway, Marilyn, Miriam, and Brayan put together the dessert. Marilyn had no recipe, she forgot to bring the oatmeal for the topping, and there were cinnamon sticks, but no ground cinnamon, so she had to chop up the sticks as best she could to use as the spice. Anyway, the meal was good. Marilyn couldn't get Victoria to sit down and visit, however. Instead, she was busy getting the food on the table, picking up plates, etc. In the culture here, women tend to be the servers, especially in their own homes. Then Marilyn drove those who needed a ride back home. At Maria's, she and Brayan, who had come along, got to see her cuyes, and Carmela got to take home some herbs from Maria’s garden. All in all, Marilyn says she thinks people had an OK time, though she’s not really sure. For Victoria, Maria, and Carmela, at least, the day was certainly different from their regular days, and it may give them something to talk about for quite a while. The idea of going to any of the churches we’ve been to here didn’t appeal to us very much this morning. Some have very loud music that forces us to use earplugs. Others don't have very friendly congregants. So we decided to have a little devotional in our room after breakfast. Consequently, we discovered that our room has at least one more “space” in it. For a long time, we’ve joked that one area of our room is Marilyn’s office, another is my office, another (with a couch) is our living room, the bed and nightstand constitute our bedroom, and, of course, we have a private bathroom. There’s even a space that serves as a tiny pantry. Today we discovered we have a chapel. There’s a little alcove where we put the large going away card and cross given to us by United Christian Church. The card has a picture of the stained glass window above the altar at our church. I sat in front of that alcove and Marilyn pulled up a chair and, voila!, our own little chapel. We even had music because the sound system at the church next door was going full blast, which meant that the decibels were at a comfortable level in our room. Marilyn picked a passage from Chronicles that we took turns reading. It seemed to be a benediction of what we've been doing and was quite comforting. To finish, I started a prayer and she finished it. Because we don’t understand spoken Spanish all that well (yet), our little devotional was at least as meaningful to us as attending a church service. And seeing our little alcove as a chapel transforms it into another beautiful place in a land of beautiful places. After we had finished things that needed to be taken care of, and eaten almuerzo (lunch), we decided to drive to Parque Archaelogical Cochasquí. This park has several pyramids composed of basalt slabs that are now covered with grass. We got there after the park had closed, but the drive was spectacular. Some people think the site was built as a fortress because of its strategic location. Others surmise it was built as a celestial observation point because of circular structures that have been found, plus the fact that it is aligned directly between Volcán Cayambe and another well-known celestial observation point. It is only 3 minutos off the equator. We went through Tocachi to get to Parque Archaelogical Cochasquí. Tocachi reminded me of some towns in south Louisiana, in that it’s built linearly – along the highway. No bayous or shrimp trawlers along here, though. We were about 3,000 metros high. Instead, we looked up a mountain on one side of the highway. On the other side of the highway, it was as if we were on a balcony – a really, really high balcony. The earth dropped away and we could see for miles and miles, including numerous volcanoes, plateaus, and barrancas (canyons). Almost every casa in this small town had this view. A few weeks ago, we went to a town called Mira, which the guide book we have (The Rough Guide to Ecuador) describes as “The Balcony of the Andes”. There’s no doubt in our minds that Tocachi rivals Mira for that title. At the park itself, Marilyn walked where she could (since the park was closed) and I got out of the car and waited in the parking lot. From there, I still had a grand view, including the beautiful snow-covered cone of Volcán Cotopaxi, the cloud-shrouded Volcán Pichinca, and a large portion of the city of Quito in the distance. We’re told that six volcanoes can be viewed from various spots on the pyramids. We noticed caballos and asked where they went. For $20, one can ride for two hours to Laguna Mojanda high on Volcán Fuya Fuya, which is one of our favorite spots, and two hours back. For $40, six people can take a 45-minute jeep tour to Laguna Mojanda. I assume it’s 45 minutes back to Parque Archaelogical Cochasquí, not 45 minutes roundtrip. Ecuador has so many beautiful places. We've primarily restricted ourselves to the Andes on this stay. That means that there are scores of beautiful Ecuadorian locales along the coast, in the jungle, even in the Andes, that we won’t see. I am continually amazed that we are fortunate enough to be living and working here for an extended period of time. Some call what we’re doing God’s work. I merely think of it as connecting with people different from ourselves in the vague hope that, somehow, the world may become more peaceful, more open, more just, more caring. Each time I behold a spectacularly beautiful place and think about how marvelous it would be to live there, however, I am reminded of the short conversation Marilyn had with a resident of Apuela, a town set high in beautiful mountains. Did he mean the people couldn’t appreciate the beauty because life was so difficult without enough money? Did he think that money was more beautiful than nature? Did he not realize the inherent beauty in the life he led? I'll never know exactly what he meant. But his statement is something to reflect upon as I am fortunate enough to type these words into my expensive MacBook and potentially share them with millions of people. His statement haunts me, nags at me, each time I marvel at a beautiful place, or beautiful people, or a beautiful object. It may do so until my dying day. I've always heard about female intuition. What about male intuition? Is there such a thing? I'm sure there is at some "basic" levels - sensing danger, determining how to best provide for a family, figuring out where to best hunt animals for food - but, in my mind, female intuition has always been associated with "higher" levels, such as determining what is the most socially acceptable thing to say or do. If I have the "higher" form of male intuition, I think it kicked in last night. As we were going into the hotel last night after a full day of fun with friends, I saw a distinguished looking gentleman with a cane getting into his car. Somehow, I knew he would be interesting to talk with. I hoped we would see him at breakfast the next morning. At desayuno this morning, there was the usual guided tour that's here on the weekend for the Otavalo mercado, as well as about three families with one child each. (Marilyn observed, "If you want to travel in Ecuador, it may be too expensive to travel with more than one child.") The families were no doubt here because of the three-day holiday weekend celebrating 10 de Agosto, Independence Day. Towards the end of the meal, the distinguished looking gentleman sat down at the next table. However, my back was to him, so I couldn’t see who was sitting with him. Upon finishing our meal, Marilyn took her computer back to nuestra habitación (our room) before coming to get me. While waiting, I turned around so I could see the activity in the rest of the dining room. To my surprise, the man with the cane was with a woman in a wheelchair. Of course, I wasn't surprised he was with a woman in a wheelchair. That's natural. I was surprised because last night I had assumed that he was the one with the disability. Indeed, he was slightly disabled, but not so much so that he couldn't get his wife up and down the steps of the hotel. Now I really wanted to meet him AND his wife. How could I swing it without disturbing their breakfast? In walked Marilyn. My problem was solved. Marilyn started talking to them just as natural as you please. She’s friendly that way. Living in Texas for 25 or 30 years has that effect on people. Soon, I was in the conversation and answering questions about the ramps we brought from the U.S. María and Juan were contemplating ordering the ramps, when I had the bright idea of bringing a pair back for them the next time we visit we the States. That idea was a winner. We exchanged email addresses and they invited us to visit them when we were in Quito. We, of course, invited them to use our ramps as much as they needed while they were here. Juan y María were a very delightful couple to talk with. My hunch of the night before had proven correct. Maybe I do have the "higher" form of male intuition after all. Then, again, maybe I spent so much time in la cocina (the kitchen) while growing up that the female intuition of my mother and her friends rubbed off on me. One of the reasons I so like Ecuador is because of the people I have met here. When I can spend time with Ecuadorian folks, I enjoy myself. Last week, I had an opportunity to spend most of my day with different groups and individuals that made my day particularly special. The way I began my exceptional day was teaching my twice a week pre-school English class in Caluquí. I am usually greeted with many Goood mor-ning, teecher’s, as I walk through the playground and into the building. And this was no exception. What a way to be greeted! "Let's all siiiinng... The Body Parts Song!" I have moved the class to a different room as it is more conducive to hanging posters and having the children sit in two semi-circles rather than a circle. This has enabled all the children at the same time to see the drawings and pictures I use. 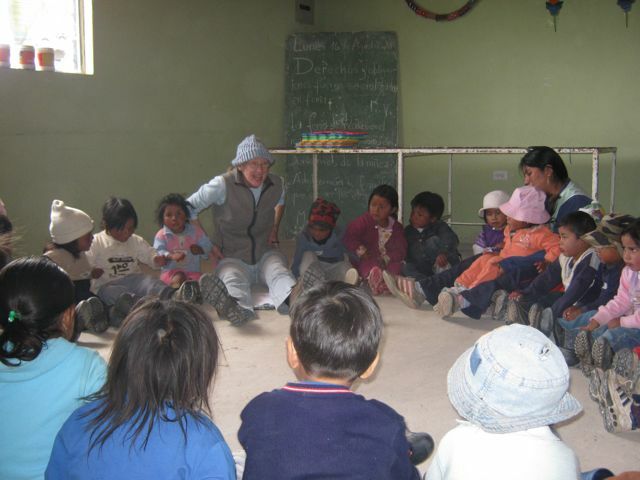 The class also uses an open space for more active activities toward the end when the children are restless. In addition, I’m using more rhythmic and singing activities to help them remember their new English words. All in all, because the children are learning and understanding better and I’m finally getting more of my students’ names, class was a real joy. When I returned home, Glenn suggested I visit Maria before I run out of time during the week. In July, Don Segundo, one of the gardeners here at the hotel, was not at work. When he finally returned after an absence of 4 weeks, I asked him how his wife was. I had heard that she was ill and he was staying home to take care of her since they had no children that could stay with her. Don Segundo is a very quiet man whose first language is Quichua, but he does speak some Spanish as well. He must have spoken to me for 5 minutes which is way more than the usual Buenos Días that we exchange. Although I did not understand all that he said, I did understand that he was very concerned and very sad. Isabel filled me in on the details later. Don Segundo had had to take his wife to the hospital where the doctor recommended that Maria have an operation. Because their church did not allow operations but expected God to heal, they did not consider the operation. Nevertheless, Maria was not totally well in addition to being lonely while at home all day. I asked Isabel if she thought they might feel OK with my visiting Maria on occasion. By the evening of that day several weeks ago, I had the answer: I would go home with Don Segundo on the bus after work and meet Maria. 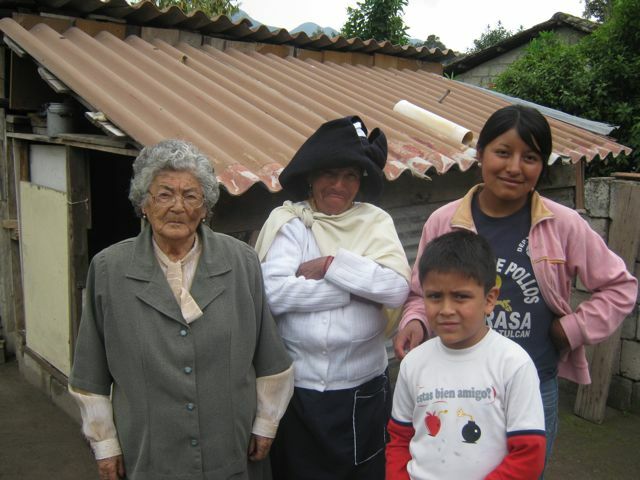 Maria’s first concern was that she spoke only Quichua and only understands some Spanish. I speak no Quichua. How would we communicate? In spite of these limitations, she decided it was OK and now I drop in to say hello about once a week since that time in July. Getting back to the second activity of my great day, I took Glenn’s advice and went to visit Maria. She was glad to see me as always. Although I don’t understand much of what she says, I do get just a bit on occasion because there are some words similar to Spanish. I must serve some purpose as she enjoys talking to me. And we always share a prayer. Sometimes she begins in Quichua and I end in Spanish or vice versa. I enjoyed my visit with Maria this day, too, especially since we decided that next time I would take her to visit Victoria, Isabel’s mother, who is also sick and lonely during the day. And, the real plus is that Victoria speaks Quichua! After almuerzo (late lunch), Glenn and I took three of the women who work at the hotel on an excursion when their workday ended at 4:00 p.m. Margoth and Rosa clean our rooms on a regular basis and Elvia cooks many meals for us. None of them own cars, so getting to go to a scenic place can be a special occasion. They piled into the back of our car and we headed up to Laguna Mojanda, a spring fed lake that provides water for the communities south of Otavalo and Otavalo itself. The 1 hour drive up 4,000 feet is filled with lovely views of Otavalo from above and farms on steep mountains. We stopped several times to take in the sights. When we arrived, Rosa headed down a hill to a lookout above the lake. We all followed while Glenn waited patiently in the car. Then our legs carried us up towards Fuya Fuya a little way before returning back down to the lakeshore to touch the water. We were all surprised that it actually wasn’t too cold in spite of the 12,400 feet elevation. We all were wearing jackets and hats because the air temperature was cold! After a little more exploring, we headed back down the cobblestone road to Otavalo. What fun it is to share experiences with others. Not all my days are filled with great encounters among the delightful people Glenn and I know here in Ecuador, but a day like I just described makes us aware of how sharing the love we receive brings joy back to us twice over. A few days ago, Marilyn and I had gone over to help Elvis, Isabel's oldest son, paint the space they had rented for his forthcoming venture - a bar. It's a large room, with a bathroom a little bigger than a closet. Only, there's no toilet, sink, or urinal in el baño yet. It's the owner's responsibility to install that, and Elvis and Isabel are only renting. Marilyn did a good job of painting. 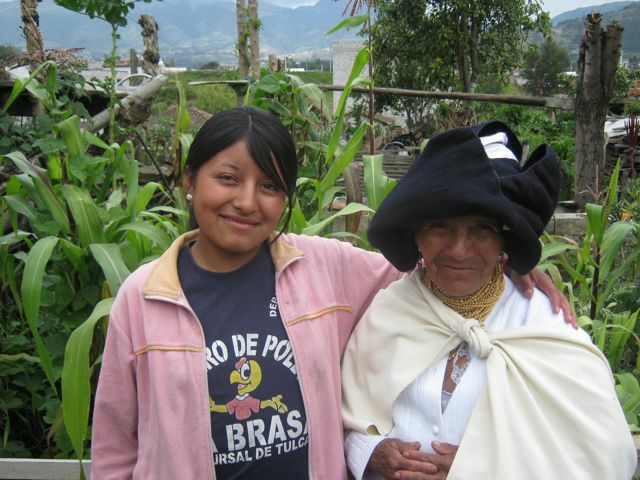 After all, she had had muchas practicas when the mission groups came through this summer. She was also good at finding jobs that Brayan, Isabel's 8-year-old son, could do so that he could be a part of the team. We talked about names for the bar, and, because Elvis's name is Elvis, I came up with Hound Dog. That didn't translate too well into Spanish, however. He decided on the Latin word "Oteum". He said it means to relax. Not bad. I'm still partial to Hound Dog, though. Today, when Isabel finished work at 4:00 p.m., we took her, Elvis, and a friend of Isabel’s named Auri to the mall in Ibarra. (Funny how they do things here. Isabel didn't ask if we could take Auri until we were all in the car and onto the street. Auri was waiting on the side of the road about 4 blocks away. If we had said we couldn't take her, I guess Isabel would have called and Auri would have simply walked back home.) Auri and Isabel told us they've been friends since school. Their sons are about the same ages, except that Auri has one more. The main purpose of the excursión was to buy glassware for Elvis’s new bar, but we all had fun walking around. On the way, Elvis told us he was naming two cocktails after us – Cocktail Marilyn and Cocktail Glenn. Can't wait to try them. At least, we'll be famous in one place in Otavalo, Ecuador. I've always wanted something named after me - a baby, a park, a street, a school, a monument, a town, a country, a bright star in the heavens - something. A cocktail works as good as anything else. While Isabel, Elvis, and Auri were purchasing the glassware, Marilyn and I looked at a store that sold Apple products. Then we purchased a couple of models for Brayan to put together on our upcoming trip to Cuenca so he wouldn't get too bored in the car during our long drives. Marilyn is good at planning and is efficient. In fact, in her usual well-organized manner, Marilyn got me back into the car at the appointed time, before the rest had returned. When they did return, they suggested we all go to another store. So they had to get me out again. Sometimes Marilyn is a little too efficient. Isabel bought a sweater and two pairs of shoes, and I bought an undershirt. Marilyn had ripped an old one by accident two days earlier and I hadn't brought many down to begin with. Only, I didn’t really buy it. Isabel wouldn’t let me pay for it. We walked around some more, then had pizza, then shopped some more without finding anything, then drove back to Otavalo. It was really neat to watch Isabel and Auri interact with the comfortableness of old friends. 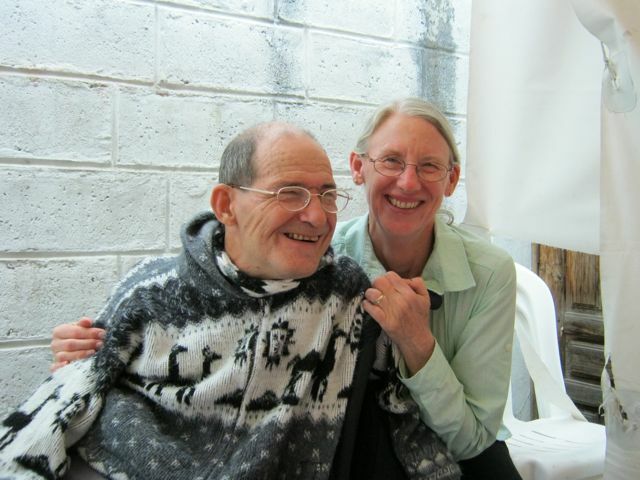 Though they both live in Otavalo, a pretty small town, their houses are fairly far apart, and work and transportation are not conducive to visiting in person. However, they talk on the telephone nearly every day. As is usually the case when we take Isabel anywhere, she invited us to her house for chocolate caliente y pan de yuca (hot chocolate and yucca bread). We had never had pan de yuca, and it was really good. Victoria had been ill and in bed most of the day, but when we went into her bedroom, especially Marilyn, and invited her to eat with us, she got up. Isabel was amazed when she was told to set six places instead of five. There's no doubt in my mind that Victoria truly loves Marilyn. Isabel says that Marilyn can get Victoria to do things when no one else can. Auri came over at 10:00 a.m. the next morning for a visit. She doesn’t live far from the Ally Micuy. She brought a gift of higos (figs). Yum. Isabel stayed for the entire visit and we had a very nice time. Auri invited us to her casa for almuerzo at noon on Wednesday. That was fast. We only met her the night before. Of course, she did say that Isabel has told her so much about us that she feels she knows us. Have we connected with another friend in Otavalo?